Perhaps you've heard of Laver's Law. He forgot 5 years after its time: Redorkulous. Paisley in fun fur, spotted at Nordstrom for $288! This one's from the same company. It's like a sane, decent sweater being attacked from the rear by another much uglier sweater. I don't think Laver has a law for this. 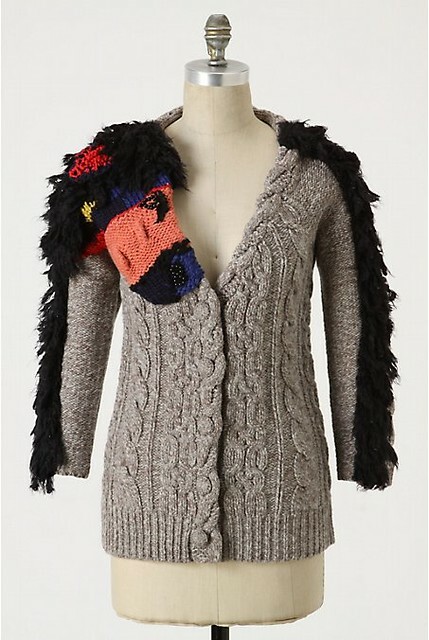 Sorry to repeat post - but the 2nd sweater looks like muppet roadkill. Is that Puff the Magid Dragon attacking the gray sweater's sleeve? Or fungus from my fridge? Gack. It's really too bad that someone had to get "artsy" on that second sweater. That pony is sucking the life out of a beautiful cabled sweater. If I ever see someone with this, I might have to yell at them for encouraging this. There ought to be a law forbidding such atrocities. I think the paisley sweater looks like 1985, which makes it 25 years past its time. I guess it's time for the 80s to be the new retro look, eh? The second one, well... that one doesn't have a time. Its awfulness is timeless. OH, is that a pony on the second sweater? I see a fuzzy Cirque du Soleil performer draped across the shoulders. Scary! ohh, a pony. Man, I could not for the life of me figure out what that was supposed to be. Actually, knowing that does not help. As for that other sweater, I dunno, I see hairy bacteria or something. Maybe these sweaters have some value after all in a rohrschach sort of way . . .
That's a pony? Really? I thought it was an unhappy face over the right breast area.